Every challenge to detectives counts as a provocation! 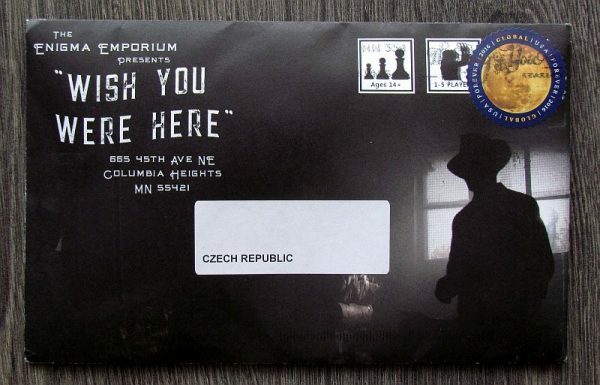 If a crime perpetrator thinks he’s so smart he can send postcards to his haunting dogs, then he’s foolish. But this time the game has changed! Wish You Were Here is a series of puzzles, that can simultaneously create an experience and a complete story. It’s a unique Enigma Emporium project. And perhaps because of its very favorable price, slightly more than ten dollars, it gained much attention on Kickstarter, where it received support from more than a thousand lusty players. The envelope came to us just before Christmas and that’s good because these tasks are great for long evenings. 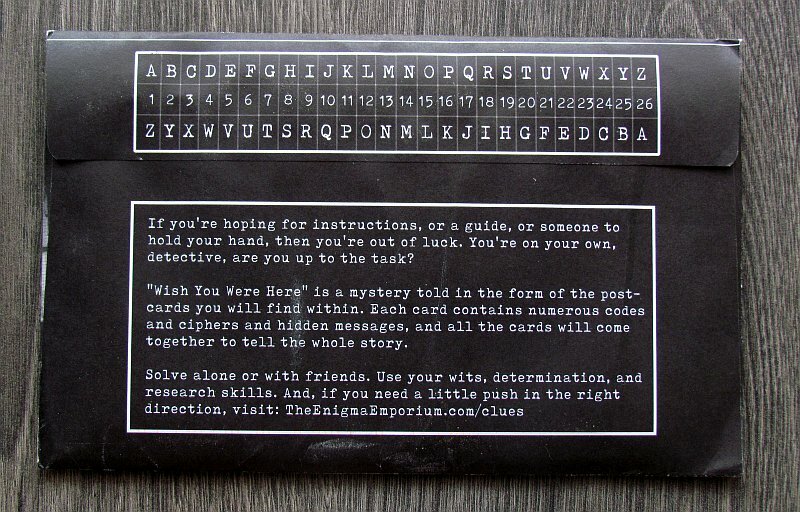 The whole puzzle will arrive to those interested in a mysterious black envelope, that already contains one important helper printed on its front. Above all, in addition to your stamp and address, it contains five postcards. Each of them looks completely different and contains a number of texts, pictures and numbers. There is no need to hesitate – all of these are mysterious and complex ciphers, where players are expected to find a solution by thinking hard. The only exception to this is the postcard with the title inscription, where the introduction to the story is located. Or maybe.. is this a puzzle too? You never know! As you gradually penetrate the secrets of all ciphers, you will understand, that nothing is as it may seem. And there’s nothing ordinary or without a meaning. The postcards content is thoughtful and really interesting. 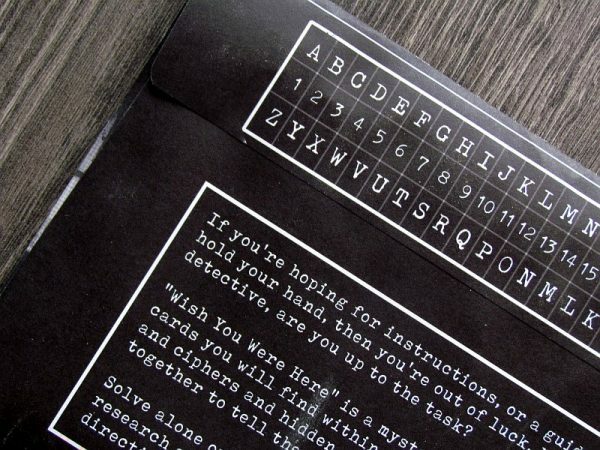 In addition, all these puzzles are able to tell the story in addition to teasing your brain. Story is not inventive or original, but it is here, and it is only an attempt for it, that deserves a great compliment. Everything makes sense, even if you sometimes have to make some additional steps to learn everything you need. It is clear, that you will need the results of each cipher even afterwards. All of these solutions are clear and logical, and if you find a solution, you can be sure its right. You do not need any control mechanism. 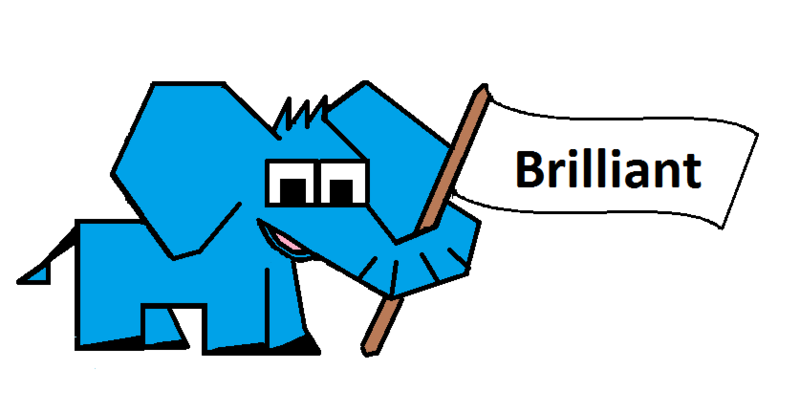 It is good to have a team of more eyes available at your disposal. You can solve the puzzles equally well alone, but then you will not have anyone with whom to discuss your theories or share experience. On the other hand, one postcard will be difficult to split among players, when doing multiplayer. But there are more open paths at a time, so everyone can devote themselves to something else and share afterwards. Total game time is hard to estimate and can be in the order of several hours. From three to five or more, if you’re really stuck somewhere and most imporantly – if you’re like us: stubborn without looking at the help. But even if everything goes well and you solve everything in three hours, you will have a lot of intense cipher experience. And that’s really worth the investment of ten dollars. The length and ability to solve individual puzzles depends a lot on the players’ experiences. If you have never done anything like this yet, then postcards will be torment at first. Believe us, we speak from our own experience. Fortunately, if you do not give up, you will succeed. And if not, and your uncertainty begins to border with frustration, you can do two things – put a postcard away for several days (and return to it fresh) or take a look at specialized pages and ask for clues. These are well-dosed and you do not have to worry, that the authors will spoil anything without warning. A set of postcards with a pile of puzzles is great decision at the time, when the popularity ranking is dominated by escape games. That’s why Wish You Were Here is something we can really recommend. Fortunately, even after a successful Kickstarter campaign, it’s still possible to buy the game and have it sent to your post box. You’ll get plenty of fun and there is even a sequel, which we are playing (for review) right now! Wish You Were Here is an excellent puzzle game. Wish You Were Here is a collection of five postcards that will be loved by everyone, who enjoys at least some puzzles. 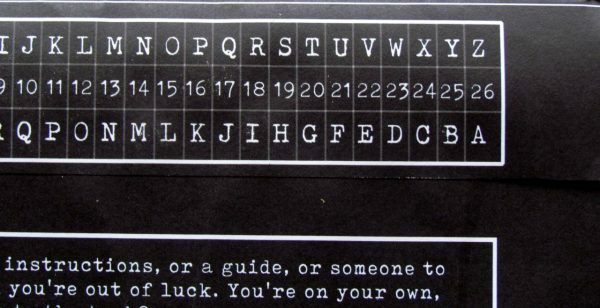 On a seemingly small area there is a surprising amount of ciphers and some of them will give you a hard time. Definitely do not expect difficulty at the level of classic escape games, but at least one floor higher. You really need to think, search and combine. 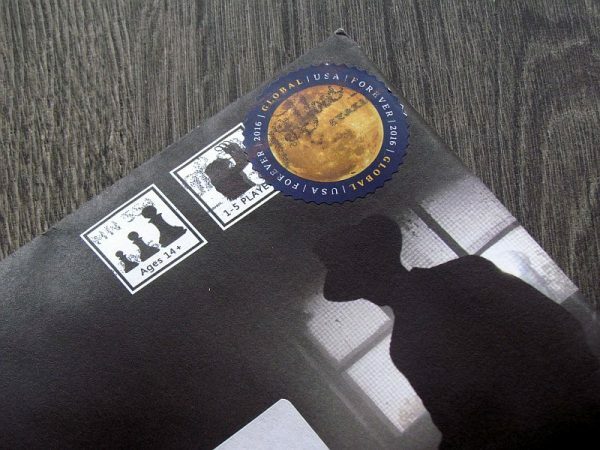 But for this, this inconspicuous envelope rewards you with a story and a lot of experience. Wish You Were Here is a great performance with a great price / entertainment ratio.